It is not at all uncommon for children especially young ones, to require the assistance of a speech therapist. Speech therapy can be very beneficial for children, helping them to articulate well, enhancing both their cognitive and social development. When parents are alerted to a possible problem with their child's speech development, either by their child's doctor, teacher, or simply through parental observation, an assessment by a speech-language pathologist is the first step to take. During the evaluation, the speech-language pathologist not only observes the child, but will utilise a series of standardised tests to asses their current level of accomplishment and compare it to the expectations for the child's age. Additionally, the pathologist will also make observations as to what the child understands (receptive language), what he can say (expressive language), the child's use of non verbal communications (pointing, nodding, etc.) and his oral-motor status. Oral-motor status involves assessing the mouth not only in its capability for speech, but also in its usage for eating and swallowing. Poor Habits: When children begin speaking, it is common for them to make a multitude of errors in pronunciation. If left uncorrected, these tendencies to mispronounce words can become a habit that is hard to break. Learning Delays: Some children have difficulty learning the meanings of new words and how to use language appropriately. Speech therapy can help children in this area. 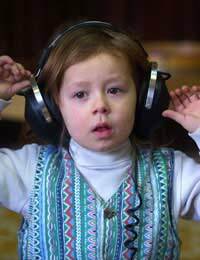 Hearing Loss: Children learn to talk by listening to and imitating the speech of others. When hearing is limited, delays in speech development are likely. Often, speech therapy involves re-teaching a child ways to control their mouths as they attempt to speak in order to get the best result. The therapist will demonstrate proper form for the child and then ask that they practice first in front of a mirror, then independently. For many speech problems, simply learning the proper placement of the lips, tongue and teeth will help children to articulate well, and with time, the new habits replace the child's less effective speaking methods. If the problems are more closely related to other language issues, rather than simply clarity of speech, various games will be employed to improve a child's grammar and comprehension. The assistance of parents and other carers is vital to a child's success with speech therapy. Practicing between sessions is important so that the lessons will be internalised quickly, helping the child to make steady progress. Parents need to offer encouragement as their children take steps to master new skills, improving their abilities to speak, listen, and follow direction. Opportunities present themselves constantly, but parents need to be alert for chances to implement the things learned in speech therapy and apply them to their child's daily lives. The speech therapist will often provide parents with a list of "homework assignments" for them to complete with their children. Making it a family priority to complete these tasks is beneficial in that it not only helps children's speech and language development, but demonstrates to them that their parents take an interest in their welfare.